Infrastructure funds agreed to snap up two clean-energy companies in the past week, both with billion-dollar deals. And they’re hungry for more. Funds are raising billions of dollars from institutional investors for assets including renewables. As the economics of building and owning power plants get better, in part because of U.S. tax incentives, these power plants can deliver predictable long-term revenue. Institutional investors have realized that wind and solar power offer a safe play with decades of visibility, and in recent months have stepped up their efforts to buy such assets, said Nathan Serota, a New York-based analyst at Bloomberg New Energy Finance. There’s a who’s who of companies raising capital to direct toward infrastructure, or already spending money from recently closed funds. BlackRock Inc. has invested at least half of a $1.6 billion fund dedicated to renewable-energy assets. Blackstone Group LP, meanwhile, is raising as much as $40 billion for its infrastructure fund, and may invest some of that money in renewables. KKR & Co., a firm with renewables investments, has sought to raise $5 billion for its third infrastructure vehicle. And Brookfield Asset Management Inc. expects to begin fundraising this year for a fund that may include money for renewables. “This is not private equity driving it, this is the customer of the private-equity firms driving it,” said Jeffrey Tannenbaum, founder of Fir Tree Partners Inc., which sold solar company FTP Power LLC to buyers including Alberta Investment Management Corp. for $853 million last year. Such customers include European and Canadian institutional investors. Much of the money is coming from institutional investors like pension funds and insurers. They typically want to own wind and solar farms for their entire lifespans. Many prioritize modest, predictable returns over growth. Some even want to develop projects, too. “Infrastructure funds go after them because they see them as annuity-like, with stable cash flows,” Angie Storozynski, an analyst at Macquarie Capital, said Thursday. 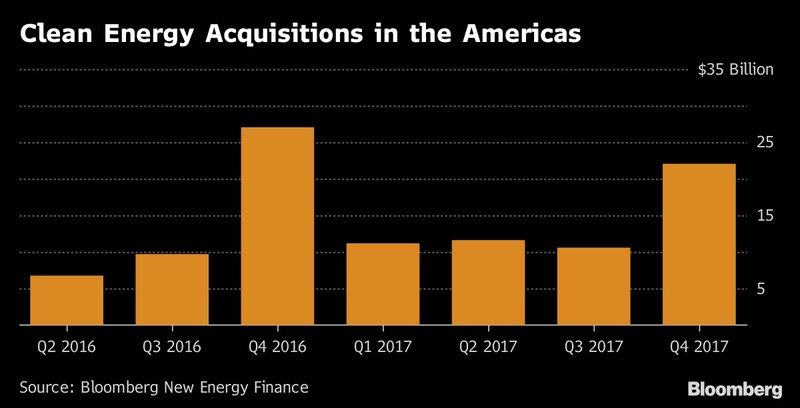 Global Infrastructure Partners, which last year closed a $15.8 billion infrastructure fund, this week agreed to buy NRG Energy Inc.’s renewables-development platform and the power producer’s stake in a publicly traded clean-energy company for $1.38 billion. Two days earlier, a unit of Swiss asset manager Capital Dynamics AG agreed to pay $977 million for a solar-focused company. The deals followed Brookfield’s acquisitions of the TerraForm companies last year from SunEdison Inc.